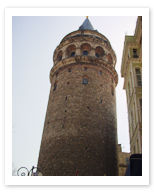 This 65 meter (205 ft) tower forms a distinctive silhouette high above the Galata (Beyoglu) side of the Golden Horn. Built in 1348 by the Genoese and called the “Tower of Christ”, its most obvious function was as a defensive watchtower. It was also the launching pad for a notable eccentric, Ahmed Hazerfan Celebi, who in the 17th century built himself a pair of wings and flew off the tower, much to the delight of the sultan, who watched along with other astonished Istanbulites. Today, the panoramic views of passing ships are admired by tourists, rather than guards or flying bird-men, and the top two floors have been converted into a restaurant and nightclub.